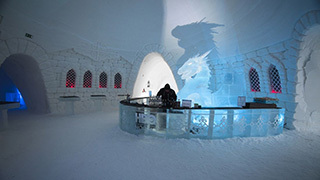 ‘Game of Thrones’ fans who have long dreamed of visiting its mythical Seven Kingdoms can now get the ultimate Westeros experience thanks to a very cool new hotel in Lapland, Finland. 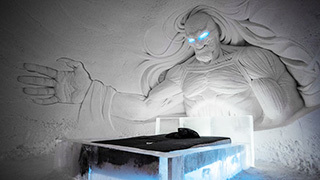 Located in the resort of Kittilä -- 200 kilometers above the Arctic Circle and around 90 minutes from Helsinki -- the destination is made up of 24 rooms -- 10 of which are suites for guests staying overnight. Temperatures reach - 5 C inside, so high-quality thermal sleeping bags are on hand to keep guests warm, as well as hot berry juice in the morning. Although it's recommended that guests stay at the hotel for a maximum of one night due to the icy conditions, there are warm log cabins available should they wish to stay longer in the SnowVillage. 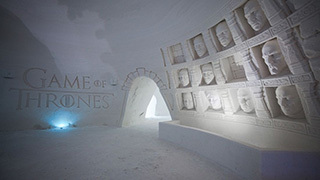 Travelers can book an overnight visit at the snow hotel starting at about US$200 with buffet breakfast, or simply take a day trip to the SnowVillage, which covers an area of about 20,000 square meters.